Here at Toyota of Goldsboro, we appreciate your interest in both our site and in our store. We hope that your web experience has been a pleasant one, and that you will visit our store, located at 301 N Oak Forest Rd, Goldsboro, NC 27534 to view all of our new and pre-owned inventory, including the Toyota RAV4, Camry, and Prius to name a few. We offer a very extensive inventory list at competitive prices. Our service department is willing and ready to assist with any needs you may have in the maintenance of your new or used Toyota, as well as any other make or model vehicle. Our prices are very competitive. Our goal is to make sure that every customer receives the quality service that we have built our name on. We take pride in keeping your vehicle in the same condition it was in when it rolled off the showroom floor. Because we want you, the customer, to feel comfortable when bringing your new or pre-owned Toyota to our store, we invite you to come in and meet our staff. Since money is tight, we are proud to give you special vehicle offers on both new and pre-owned Toyotas. You can search our new car inventory or, if you are in the market for a used vehicle, we have a comprehensive inventory of those also. Our friendly and experienced sales staff can help you find the right Toyota for you whether it is a Toyota RAV4, Camry, Scion, Matrix, Prius, Avalon, Corolla, Tacoma, Tundra, or Highlander. We also offer an online order form for parts, as well as an online option for scheduling appointments. If you need financing, we can help there too. Just fill out the pre-qualifying form to find out what your price range is. If you’d rather talk to someone, please don’t hesitate to call us at 800-951-3232. You can contact us via email as well, we have staff standing by to assist you. 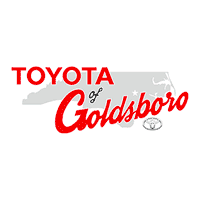 From all of us here at Toyota of Goldsboro, thanks for visiting our site and for taking an interest in our business. Remember, our aim at Toyota of Goldsboro is to convince you, your family, and your friends to expect a great deal every time you come in! We do this by having some of the most competitive specials on top of our already low new and pre-owned Toyota pricing. We proudly service the Goldsboro, NC area, including La Grange, Wilson, Kinston, Clayton, Goldsboro, and more!